New York University Press, 9780814775974, 274pp. Americans love a hard worker. The man or woman who works eighteen-hour days and eats his or her meals on the run between appointments is usually viewed with a combination of respect and awe. But for many, this lifestyle leads to family problems, a decline in work productivity, and ultimately to physical and mental collapse. Chained to the Desk, best-selling author and widely respected family therapist Bryan E. Robinson's groundbreaking book, originally published in 1998, was the first comprehensive portrait of the workaholic. Thousands benefited from this innovative book, which profiles the myths behind this greatly misunderstood disorder and the inner psychological battle that work addicts wage against themselves. Intended for anyone touched by what Robinson calls "the best-dressed problem of the twenty-first century," the author also provides an inside look into the impact on those who live and work with them --partners, spouses, children, and colleagues--as well as the appropriate techniques for clinicians who treat them. 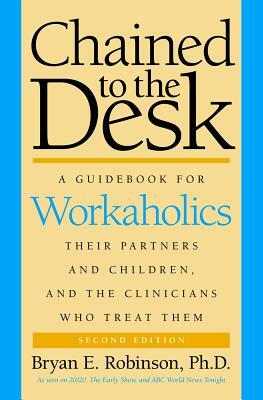 In this new and updated edition, Robinson portrays the many different kinds of workaholism, drawing on hundreds of case reports from his own original research and years of clinical practice. From California to the Carolinas, men and women tell of their agonizing bouts with workaholism and the devastations left in its wake, struggles made all the more challenging in a world where the computer, cell phone, and Blackberry allow twenty-four-hour access to the office, even on weekends and from vacation spots. Adult children of workaholics describe their childhood pain and the lifelong legacies they still carry, and the spouses or partners of workaholics reveal the isolation and loneliness of their vacant relationships. Employers and business colleagues discuss the cost to the company when workaholism dominates the workplace. Chained to the Desk both counsels and consoles. It provides a step-by-step guide to help readers spot workaholism, understand it, and recover. Robinson presents strategies for workaholics and their loved ones on how to cope, and for people in the workplace on how to distinguish between work efficiency and workaholism.